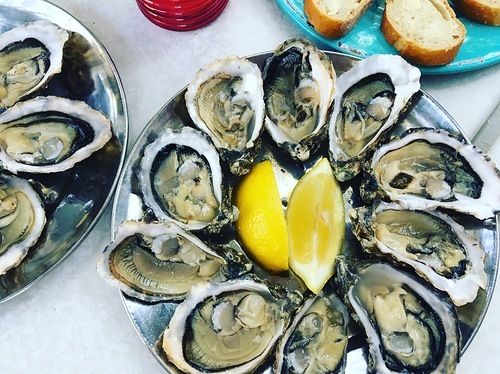 I love oysters - especially when they're grilled, Rockefeller-style. And I'd have to agree that Lobster Thermidor is a classic taste sensation with good reason. Whenever I've been fortunate enough to eat caviar, it's always lived up to the hype. But do the most memorable meals always rely on star ingredients? I can savour a well-spiced cauliflower steak (thanks to Ottolenghi) just as much as I might steak tartare - if not more! A simple tomato salad made with the freshest, ripest, new season tomatoes, dressed simply with good olive oil and lemon juice, is hard to beat on a summer's day. And sometimes, just bread and cheese can be a revelation. My introduction to the joys of this most humble culinary combo came via a friend/boyfriend, not long after I'd managed to extricate myself from an abusive relationship. I'd spent several months being worn down by a constant critique on my eating habits and figure, which had led me to pretty much stop eating. So when my friend Jan invited me back to his Berlin apartment for lunch, slathering thick slices of white bread with mayonnaise, and topping with a sheet of trashy plastic cheese, before frying this decadence in a pan until the bread was crisped to perfection, and the cheese was starting to ooze out of its toasted envelope - I knew it was true love. As a fellow ballet dancer (at the time), he knew all about the pressure to look thin and starve oneself to please our weight-obsessed Ballet Director. And yet, here he was offering me a plateful of food loaded with calories, and guaranteed to pile back on the pounds I'd lost over the previous few months of mental torture. The point was - and I realise this may be hard to appreciate unless you have experienced that kind of intense physical scrutiny and emotional bullying - Jan didn't care what I looked like, whether I was five kilos heavier than another dancer, or what I ate; he loved me just as I was. Amazing what a plate of food can reveal, isn't it?! I was right though. That first lunch led to regular pit-stops with Jan, and after many more lunches, cinema outings, dinner dates, walks home from the opera house, and late night cheese toasties, he started dropping hints about marriage. At which point, being just twenty, I freaked out and ended the relationship. An extreme knee-jerk reaction, perhaps, but I wasn't ready for a life-long commitment, even for the best toasted sandwich in the world. Instead, I learned to make my own. Although, I have moved on from plastic-wrapped, pre-sliced 'cheese', that probably owes more to a laboratory than a cow. I've found that Tallegio, Brie or Gouda melt very obligingly between sliced sourdough bread, and need just a spoonful of cranberry chutney or onion marmalade, and perhaps a strip of parma ham or slick of pâté, to make the most comforting of comfort foods on a cold day. 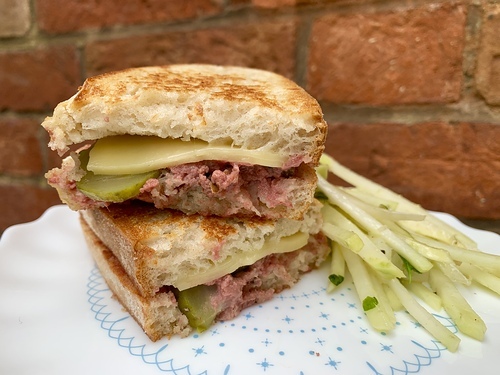 Raclette cheese, garnished with sliced cornichons or gherkins, sandwiched between some nutty, dark rye bread, transports one to the Alps in a single mouthful. Thick slabs of garlic-fried aubergine are a perfect foil to smashed avocado and a little finely chopped preserved lemon, for a vegan alternative.